The title is not a joke or a poke in the eyes of techno-enthusiasts, believe me. Writer Amanda Ripley visited classrooms around the world and found that the best ones–her opinion–are low-tech. Specifically, she cites South Korea and Finland, countries that outscore the U.S. in international tests, as having low-tech classrooms. 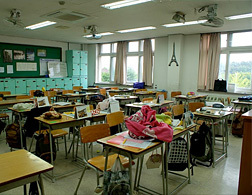 In South Korea, she cites one student who described her room having a few old computers, an overhead projector, and well, that’s the extent of the “new” technologies. In the U.S., Ripley points out that when policymakers and politicians imagine schools and classrooms a decade from now “they often talk about a schoolhouse that looks like an Apple store, a utopia studded with computers, bathed in Wi-Fi, and wallpapered with interactive whiteboards.” Yet when Ripley visited KIPP’s AIM Academy in Washington, D.C. she watched a veteran math teacher lead a fifth grade class through a lesson without a nod to the four idle computers in the rear of the room. When asked by Ripley, what would her perfect classroom be like, the teacher said: “If I were designing my ideal classroom, there’d be another body teaching. Or there’d be 36 hours in the day instead of 24.” No mention of laptops or hand-held devices or interactive white boards. Ripley’s point and that of scores of other observers of first-rate teachers is that low-tech and high-tech machines can surely help students learn but it is the teacher’s lesson objectives, knowledge of the subject, rapport with students, and a willingness to push and support them that count greatly in what students learn rather than anything intrinsic in the devices used. Consider Direct Instruction–much of which occurs in KIPP schools–and this math lesson (double click on YouTube video). The teacher uses an overhead projector, a low-tech tool that entered U.S. classrooms extensively in the 1930s. Nary a computer in sight. Direct Instruction gives progressives committed to student-centered instruction an allergic rash but its popularity among many teachers and administrators remains strong in low-income elementary schools, “Success for All” programs, Open Court reading, and similar structured teaching strategies. And what about those first-rate teachers whose students are surrounded by an abundance of laptops, interactive white boards, camcorders, flip video cameras, and a host of other devices? They still have to figure out the specific target for the next lesson, how to get students engaged, what activities will hit the target, and how will the teacher know that students grasped it. For these teachers sometimes the high-tech cornucopia gets in the way. Listen to a high school English teacher who is in a 1:1 laptop school (I am quoting Steve Davis who wrote the following comment on my October 15, 2010 post). High performing teachers use high-tech and low-tech to engage and reach their students here and abroad. Not either-or. So I end by repeating what has become a cliche but needs to be said again and again: Good teaching is not about access to and use of high-tech machines, it is about teacher knowing their subjects, establishing rapport with students, and prodding and supporting them to learn. The article on Slate is more than I can bear to read. My blood pressure won’t allow me to make it all the way through. The description of South Korean schools is an insult. Dirt yards! As we Americans know, groundskeepers are essential to good education. How about a nod toward the way Koreans engage on out of classroom technology use? It is the only country that acknowledges obsession with computer games interfering with school work and has created a mechanism to combat it. Yet again, a reason I’m glad I quit reading Slate. South Korea and Finland have homogeneous populations with high averge cognitive abilities, which might also explain their great results. Direct Instruction is remarkably effective with kids on the lower half of the cognitive ability scale (overrepresented in low income populations), and it’s pretty much what I use. How telling and true — I’m glad Amanda Ripley ended with this comment. When will the technology enthusiasts accept that what they offer is merely a tool? Interested and well informed teachers who can ignite a love for life long learning are a far greater resource than any technology. Totally true. A tool. Like paper, pencils, and books. Merely a tool. I completely agree that it is possible to teach quite well without any of the technology. At least it is possible the teach the content we have decided is important. However, is it possible that we should reconsider what we believe is important to teach? Do students who will become adults in ten years need the same skills and content that was needed thirty years ago? Should we be teaching more critical literacy skills for students growing up with access to entirely new types of texts and organization of information? Honestly, I’m not sure of the answers to these questions. But I think they are worth discussing. If the objective of school is to pass along closed, test-measurable knowledge then the assessments made here isareokay. If we are in a new world where knowledge is fluid, where the new Bloom’s taxonomy includes creativity at highest point of learning, and where the digital world is an integral part of our futures, then perhaps there is more to education that accepting digital as an optional add-on tool. The problem is we have not solved how this will ultimately play out, and are caught in the unknown. We need to look forward and deeper, not just back to what has arisen from industrial thinking. I think perhaps a distinction needs to be made between technical gadgets (like an interactive whiteboard) with that of a laptop in the hands of a student. Yes the whiteboard is a flashy gadget which one could argue has little educational value – the other, a laptop on the other hand is a tool, a very powerful educational tool. A tool for gathering, organizing, analyzing and constructing information, a tool which is needed and used in almost every modern workplace one can imagine, a tool in which I would imagine you the author use everyday, at work, at home, even as you wrote this blog entry. I would suggest further that perhaps you were made aware of the article and perhaps even read the article, and developed an opinion of Amanda Riley’s article through the use of such a tool. Once again, “high performing” is the white elephant. We’re talking standardized tests right? There’s no doubt technology is not always the best choice but as I heard recently, technology doesn’t make teaching easier, it makes it different. Most of these methods are hardly different. Again, not saying that’s always bad but these types of stories do little to to further the discussion of transformative use but are simply used to reinforce traditional methods measured by traditional, cheap, low level, crappy tests. Direct Instruction Video … watch the students’ expressions … priceless. I had the same reaction to the abbreviated video. Maybe it works, maybe it doesn’t, but not once did I see the math instruction. My methods class did the same thing…spend an inordinate amount of time with non-sense. State the purpose and then present the problem to be solved. The problem must be real and not pseudo-contextual. John Dewey has been saying this for decades. How does the curriculum compare between the countries of Finland and US? It has often been said that in the US we teach “a mile wide and an inch deep.” We really need to think about why we teach what we do. Don’t waste your time with pedagogical time wasters. Education has nothing to do with technology, but rather using technology as a tool (like a pencil, calculator, internet access…) to solve a real problem. Dan, I had a similar reaction to yours at first, with respect to the math class video But it dawned on me that this was a class of ELL’s (mainly) and it would be a mistake to try to teach the concepts and processes before you’re sure that the students know the vocabulary. One of the reasons that disadvantaged students fall behind is that the teachers (and the curriculum) skip past these building blocks that the students havent’ mastered before showing up in the classroom. I agree that modern technology can help make classroom settings more interesting and engaging but still, it depends on how teachers will faciltate the discussion. moderm technology and other tools are merely assistance and add ons. I believe you have it right, Stephanie.